A painful condition following tooth extraction in which a blood clot does not properly fill the empty socket. Dry socket leaves the underlying bone exposed to air and food. The empty tooth socket following removal of the tooth. 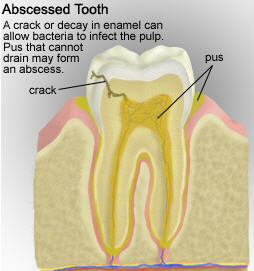 A tooth that is growing against another tooth, bone, or soft tissue. To loosen or dislocate the tooth from the socket.